When you add senders to the Safe Senders List you can view and access all the content in their emails. When setting up your new computer you can easily import your e-mail settings. The Safe List, just like the list of blocked senders, is not in the main PST file (Personal Store), but must be separately backed up and restored. Depending on the version of Outlook the procedure is different. 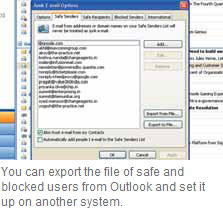 In Outlook 2007, open the 'Actions | Junk Email |Junk E-mail Options' menu item. In Outlook 2010, select the tab in the Menu bar and Start, click the section delete on the icon for junk e-mail and start there, Junk E-mail Options. In the tab Safe Sender you can now find the wanted list. Here you can fi rst select individual items and then Edit, remove or manually Add. To back up all data, click on Export. You then navigate to the folder, type in fi le name an appropriate name for the new text file and click Save. You may also Export Registry Blocked Senders list and the respective barrier. Because they are pure text files, they are easily interchangeable between versions. To transfer the data to copy the generated text file to another system, start Outlook again and navigate to the same dialog box. Now click the Import button, select the TXT file and click Open. The data can be integrated without further need for intervention into the existing list of Outlook on the new PC.